This fitted mesh cover for a plastic sandbox is a great addition for your playground. These plastic sandbox covers are designed for sandboxes made from plastic. 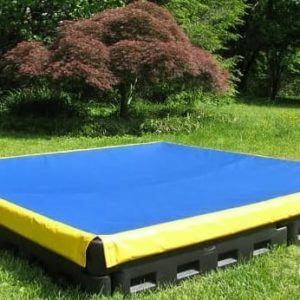 These plastic sandbox covers are tough, durable, and perfect for keeping your sandboxes clean and tidy. Choose your size. Take advantage of your winter sale: Free shipping on all sandbox covers! Our polywoven canvas, plastic sandbox covers are a great addition to the play area. To start with, they prevent sand and toys from being blown away by storms. Second, sandbox covers keep the sand clean by keeping out animals, leaves and tree branches. Our covers also protect the sandbox surface, which prevents mold and rot on wooden surfaces. Finally, these sandbox covers have a pleasing, cool blue color that looks great on any play area. This sandbox cover has two ties that you can use to secure the cover to the base of the sandbox. If you would like an estimate for a sandbox cover or have questions, just complete the form below and we'll get right back to you. (To fill out a more detailed Estimate Request Form, please click here). We sell a full range of sandbox covers for business and residential use. We ship all of our products nation-wide in the USA and internationally. Our high-quality sandbox covers are commonly used for schools, daycare centers, churches and homes. We sell a full array of commercial playground equipment throughout the United States. We have been installing and repairing playgrounds in Washington DC, Maryland and Northern Virginia for nearly three decades!